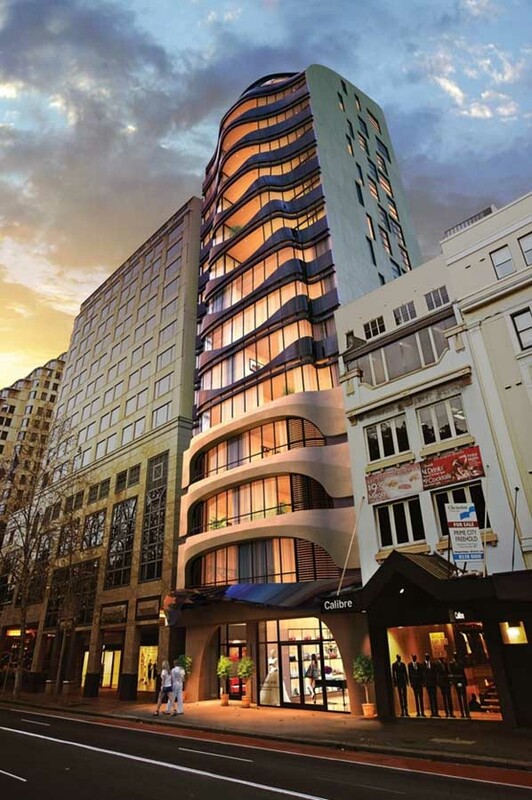 The Eliza is located on Elizabeth Street in Sydney’s CBD on prestigious Hyde Park. With only 19 apartments, this exclusive 17 storey development will create a new standard in luxury and contemporary design for Australia. The units have a unique parametrically designed façade. It responds to the changing solar, view and planning conditions on each level such that the façade on every level is different. The design features 2 and 4 bedroom units with panoramic park and harbour views as well as a 3 storey penthouse. The penthouse has been conceived as a unique world class address with roof top pool, private elevator and grand staircase and ceiling heights. For design inspiration we looked to the classics of 20th century classic design to create a world class building for a truly unique site. The Eliza is located alongside some of the best examples of historic Sydney architecture. The design in a combines fluid digital profiles with classic and elegant materials to create a building which is at once progressive and stately. This project is on of a half dozen towers by Tony Owen Partners in the Sydney CBD which feature digital design practices to create unique and exciting environmental solutions in a new approach to urban design. Developed by Ceerose Pty Ltd, construction is now commencing on site and is expected to be completed by 2012.